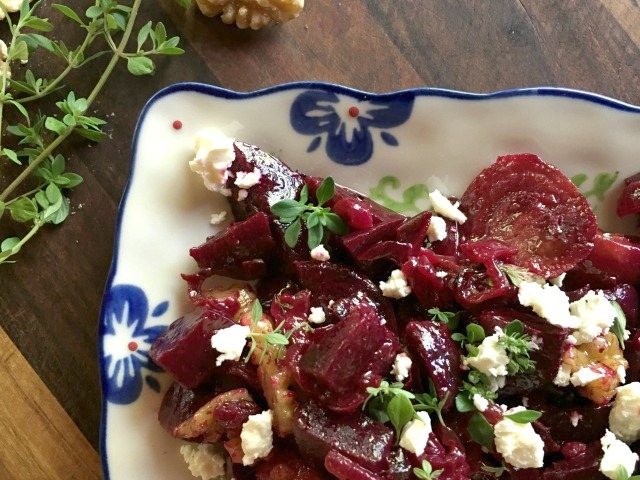 Tossed with caramelized onions, tangy feta and a tart mustard vinaigrette, beets can be the star of the meal. Local markets are overflowing with beets, one of those beautiful but underappreciated vegetables that grows so well in our climate. If you think you’re not fond of beets I’m willing to bet a taste of this roasted beet salad will make you reconsider. Roasted beets have a wonderfully rich taste. Roasting seems to concentrate their flavour and their sweetness, not to mention their gorgeous colour. 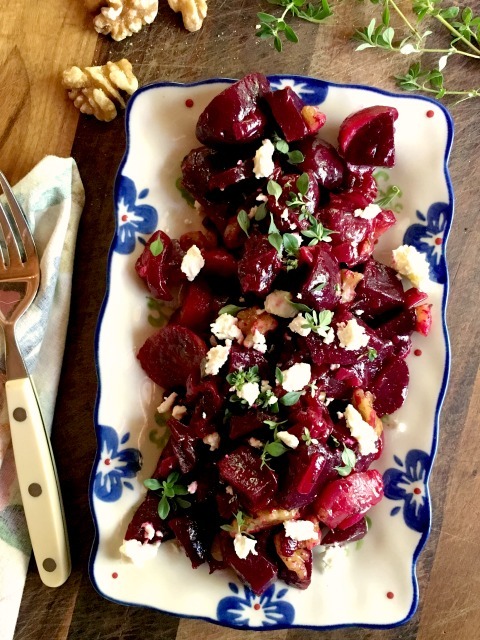 When tossed with caramelized onions, tangy feta and a tart mustard vinaigrette, humble beets can be the star of the meal. For an extra rich flavour, substitute walnut oil for some or all of the oil called for in the vinaigrette recipe. Leftover roasted beet salad can be tossed with gnocchi or boiled new potatoes. To roast your beets: wrap them, unpeeled in foil, place directly on the oven rack and roast at 375 F for about 40 minutes or until they can be pierced with a fork. When they’re cool enough to handle, slide the skins off and dice the beets. Saute onions over medium heat for at least 10 minutes (longer if you have time). To make the dressing: whisk the vinegar and Dijon. Whisk in remaining ingredients. Combine the onions with half of the dressing and add to beets. Toss. Add more of the dressing, to taste. Gently fold in feta and sprinkle over the thyme and nuts. Slice the roasted beets thinly (into discs). Stack with a slice of chevre in between. Spoon the onion-dressing mixture over top and sprinkle with nuts. Serve each stack on a bed of arugula.